McClain’s Kyla Burchett hustles down the first base line on Monday at Mitchell’s Park in Greenfield where the Lady Tigers took on the Peebles Lady Indians in a non-conference softball matchup. 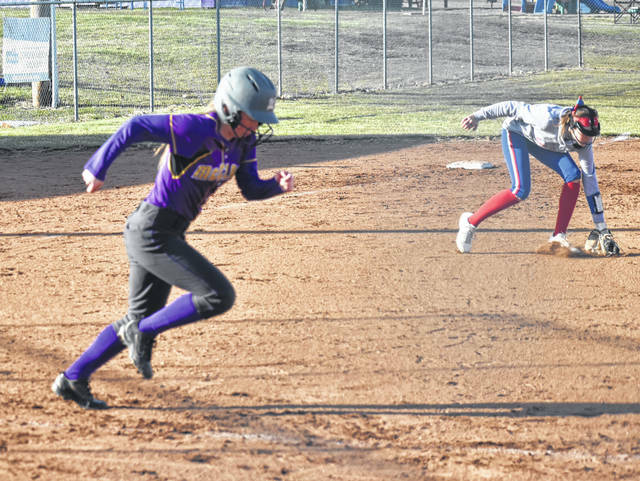 The McClain Lady Tigers hosted the Peebles Lady Indians Monday at Mitchell’s Park in Greenfield in a non-conference softball matchup that saw the Lady Indians prevail by a score of 13-2 in six innings. Sophomore Josie Crabtree got the start in the circle for the Lady Tigers and pitched all six innings for McClain in the loss to the Lady Indians. Crabtree and the Lady Tigers defense was solid for the first three innings of play with Crabtree striking out three and the defense making the necessary plays behind her limited the visitors to one run with three innings in the books. Offensively the Lady Tigers were on even footing with Peebles through three innings of play after Bri Weller scored in the bottom of the second inning when Kaleigh Easter reached base on a throwing error that allowed Weller to score from first. The top of the fourth inning saw the Lady Indians put two runs on the board in the top of the inning when the first two batters for Peebles scored to propel the Lady Indians to a 3-1 advantage. McClain answered in the bottom of the fourth inning when Kaylee Stevenson singled and then went on to score when Liz Kegley singled later in the inning and drove Stevenson in to bring the Lady Tigers within one run at 3-2 after four full innings. The Lady Tigers were unable to muster any runs over the final two innings as they went down in order in the fifth and sixth innings including strikeouts by Stevenson and Weller that ended the game after six innings. The fifth inning was the beginning of the end for the Lady Tigers as they allowed Peebles to score four runs in the top of the inning on four hits including a homerun over the left field fence from the third batter in the inning. Peebles added six more runs in the sixth inning on five hits and sent 10 batters to the plate. Compounding the Lady Tigers problems in the game McClain committed five errors after the first inning.